On Saturday night, the doorbell rang as Tim was looking for a movie to watch that evening. He opened the door to find our son, daughter-in-law and granddaughter on the doorstep, bearing pizza and early birthday wishes. He was surprised and happy. I had pretended to putter around making dinner in the kitchen, knowing that pizza was on the menu. Today around noon, the doorbell rang again. Our two daughters and their husbands stood on the doorstep wishing their father a happy birthday. His birthday is tomorrow, Monday. It's a good thing he's not overly observant around the kitchen. I had cooked enough food for the 8 of us as he wandered in and out, not suspecting anything. 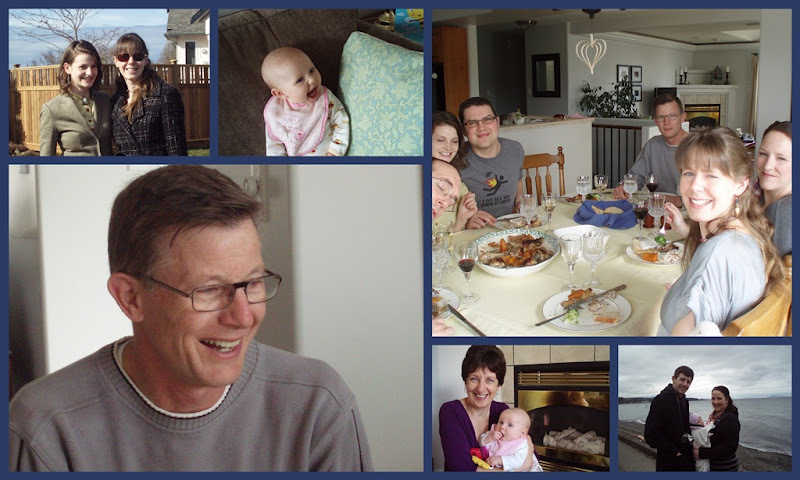 We laughed, chatted, went for a short walk, enjoyed being together, and celebrated the blessing that Tim is to all of us, as husband, father and grandfather. For more mosaics, visit Mary at the Little Red House. First of all, a Very Happy Birthday to your Tim. He's a blessing to all of you......and from what I've read, all of you are, likewise, to him. Now - that baby - just gorgeous! Does she smile like that a lot? I'll be the smile is contagious! What a nice surprise for him! What a lovely surprise....how funny that he hadnt noticed anything! Happy Birthday to your husband from Normandy. Seems to me that baby girl has inherited Grandads smile! Men! Not always the observant types. What a great mosaic celebrating a birthday and family. I can't believe how big your little grandgirlie is already. How'd she do that so fast? And her grins match the family's...she's adorable. How fun...to surprise the clueless birthday boy! And to have the third generation join in the celebrations...makes it all the more special this year. It looks like Grand-mama enjoyed herself as well! You are blessed to have such a wonderful, loving, caring family...Happy Birthday and Best wishes to Tim! what a lovely birthday suprise !! !